Fernando Figueroa wasn't in the game long, but he did record his third save on the 1990 season. Figueroa picked up the needed two outs in this May game, preserving a 4-2 Williamsport win. Figueroa went on to get just one more save. The pitcher who saw time in 37 games, starting four, also recorded 10 losses to just two wins. Figueroa was in his fifth season as a pro, his first at AA. He saw time in just three more seasons. He never saw AAA. 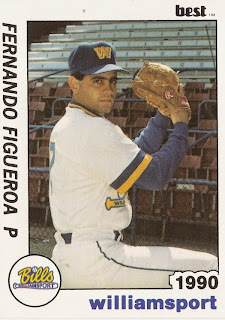 Figueroa's career began in 1986, signed by the Yankees as an undrafted free agent out of his native Puerto Rico. Figueroa played his first season in the rookie Gulf Coast League. He went 4-6 in 16 outings, 11 starts. He also had an ERA of 2.79. He played 1987 between three teams, the GCL and single-A Prince William and Fort Lauderdale. He went 5-5 on the year, with a 4.49 ERA. Figueroa played 1988 back at Fort Lauderdale. It was his final season in the Yankees system. 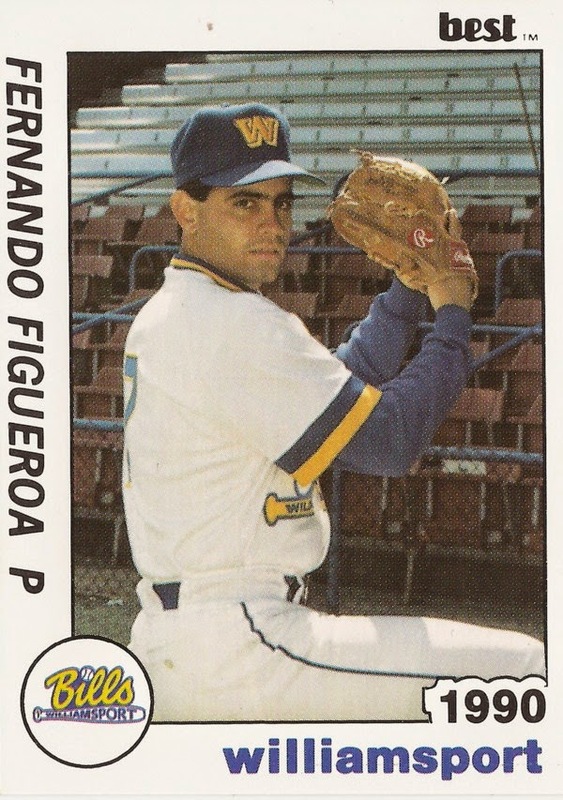 In 1989, Figueroa played with unaffiliated Miami, getting 13 outings, three starts. He moved to the Mariners system for 1990, playing at AA Williamsport. He went 2-10, with a 3.96 ERA. He picked up one of his losses in a May game where he also picked up an error. He had a balk in an August game. Figueroa remained at AA for the Mariners the next two seasons, playing at Jacksonville. In his final season, 1992, he got into 53 games, with a 2.96 ERA and seven saves. Figueroa is later credited as playing in Mexico, then briefly in the Pittsburgh system in 1995. He also played in Taiwan. His final recorded playing time didn't come until 1999 in the Mexican League.